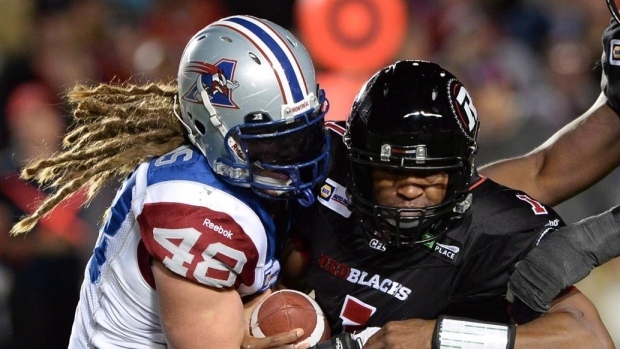 TORONTO — Two-time CFL all-star linebacker Bear Woods signed with the Toronto Argonauts on Wednesday night after being released by the Montreal Alouettes earlier in training camp. Woods, a six-foot, 245-pound, native of Macclenny, Fla., had 232 defensive tackles, 15 special teams tackles, 12 sacks, six forced fumbles and three interceptions in 40 regular season games over six seasons in Montreal. He ranked second in the CFL in 2016 and led the East Division for the second time in his career with 126 tackles, five sacks, three forced fumbles and two interceptions en route to being crowned the East Division's Most Outstanding Defensive Player for the second time in his career. Woods will be present but will not dress for the Argonauts pre-season opener against the Alouettes on Thursday night at BMO Field. Woods will wear No. 48 for Toronto while defensive end Evan Foster's jersey number will change to 43. The Argonauts also announced that international offensive lineman Jay Guillermo has retired.